Two of the most popular holiday cactus varieties are Thanksgiving cactus and Christmas cactus. 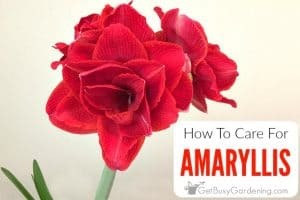 They are both easy to grow, and will rebloom year after year during the cold winter months! 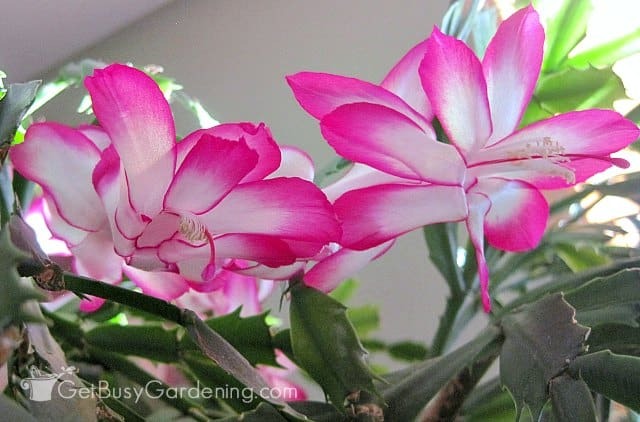 In this post, I show you how to tell the difference between these two popular plants, and share my holiday cactus care tips. Once the summer is over, most of my houseplants are done with their active growing period and will rest during the winter. But, there are a few that are just beginning to come into their active growing season in the fall. Mainly the holiday cactus. One of my favorite and easiest to care for houseplants are my holiday cactus plants. I love that they flower at an opposite time as most other plants. They add so much cheer and color into my house during the darkest, coldest months of the year! That’s why they made my list of the best indoor flowering plants! There are three main types of cactus plants that fall under the “holiday cactus” umbrella: Christmas cactus plant, Thanksgiving cactus, and Easter cactus. The Christmas cactus houseplants are by far the most well known type of holiday cactus types. 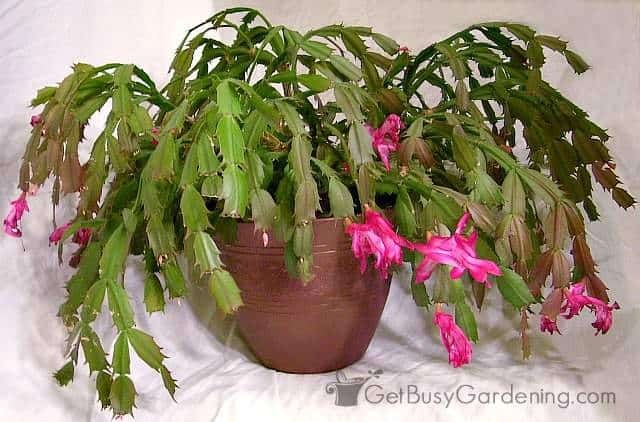 Many people don’t know that there are two types of cactus houseplants that will start to bloom during fall and winter: Thanksgiving cactus and Christmas cactus. People get Christmas cactus and Thanksgiving cactus plants confused all the time because they look very similar. However, there are subtle differences between these two cactus varieties. Once you know what to look for, it’s easy to tell these two kinds of cactus apart. What’s The Difference Between Christmas Cactus and Thanksgiving Cactus? 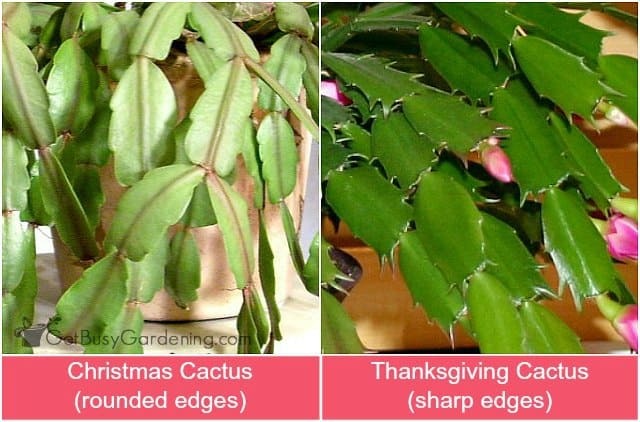 Once you learn how to tell the difference between these two holiday cactus plants, you might be surprised to discover that the plant you’ve always referred to as your Christmas cactus is actually a Thanksgiving cactus (or visa versa). One main difference between a Christmas cactus and a Thanksgiving cactus plant is the shape of the leaf segments. 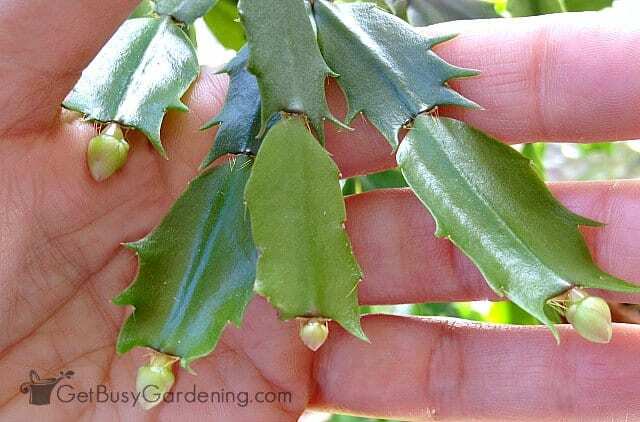 Christmas cactus leaf segments are rounded and Thanksgiving cactus leaf segments have sharper points. Another difference between these holiday plants, is the time when they bloom. Thanksgiving cactus blooms in November, right around Thanksgiving time. Christmas cactus plants bloom sometime in December, close to Christmas time. Now it makes sense as to how these indoor cactus plants got their nicknames, right? Winter cactus plants have an opposite growing season than most houseplants do. They like to rest during the summer, and they flower in the fall or winter. 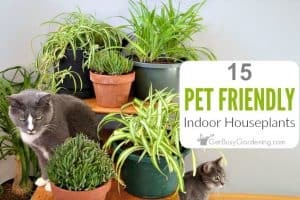 Usually, I will move my holiday cacti to a south facing window and start watering it more often in late August or early September in order to trigger the blooms. After a few weeks, I will fertilize my winter cacti and leave them in the sunny location until after they’re done blooming. I recommend using an organic plant fertilizer for potted cactus plants, rather than a harsh chemical one. A general purpose indoor liquid fertilizer works great, or you could use compost fertilizer tea. Once my plants are done blooming, I will slowly reduce the amount of water I give them and keep the soil on the dry side for the rest of the year. In the early spring, I move my holiday cacti away from the sunny window so they can rest all summer. Keep your holiday cactus plants out of the sun in the summer, hot sun could damage the plant. 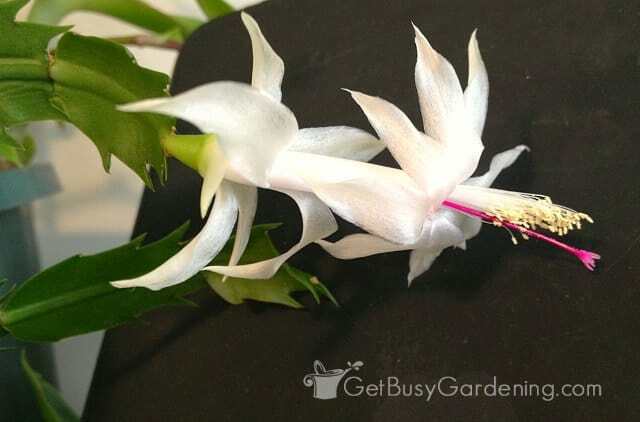 The best time to take cuttings for propagation is after your holiday cactus is done blooming. 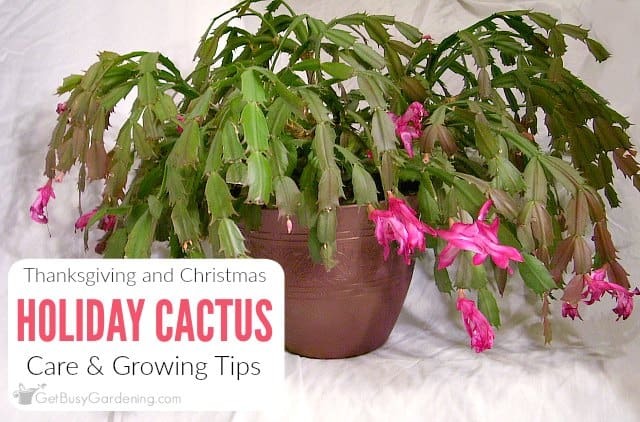 Holiday cactus plants like to be root bound, and will produce more flowers when pot-bound. If your plant needs to be repotted, it’s best to repot it in early spring. You can use a general purpose potting soil, or a succulent soil mix. Never overwater your holiday cactus. Keep the soil on the dry side when its not actively growing. 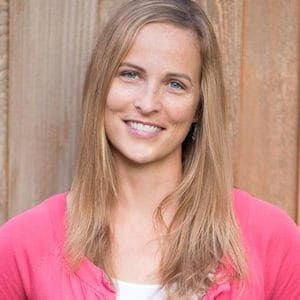 During their active growth period (fall-winter), the soil should be kept evenly moist. If you struggle watering correctly, I recommend buying a soil moisture gauge to make it easy. 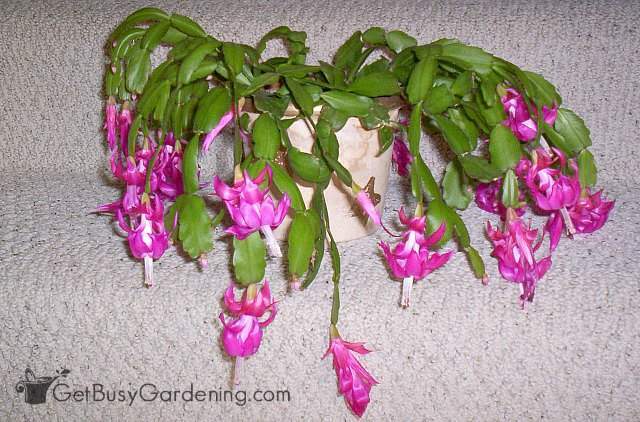 Holiday cactus plants thrive on neglect most of the year. If you love winter blooming plants, then you should definitely add these gorgeous cactus plants to your collection. 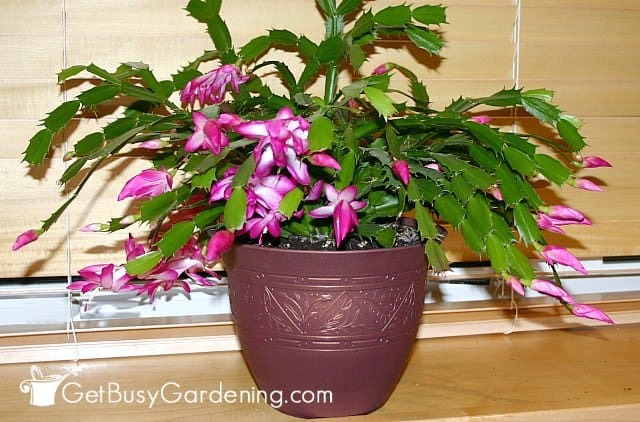 Follow these easy holiday cactus care tips, and you’ll enjoy flowers year after year! Keeping houseplants alive during the winter is a struggle for many gardeners. If this sounds familiar, then pick up a copy of my Winter Houseplant Care eBook. 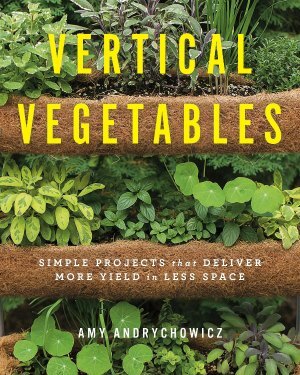 It has tons of information about how to care for plants (including fun winter flowering plants!) through the long winter months, so they won’t only survive, they will thrive! Share your holiday cactus care tips in the comments section below! Thanks for showing us the difference…..now I know what my cactus is…..! I had a friend who kept hers in a pot but out in the direct sun light all summer. I’m trying to save it. I have it in my basement with a grow light. Its wilty looks almost dead. I will try to send a pic. Can it be saved? And what can I do to bring life back. I’m not expecting flowers this yr. Just want to revive it get some green in the leaves. As long as the main stem is intact and firm you should be able to save it. Just be careful not to overwater it. You can also trim off any leaves that were heavily damaged from the sun to help encourage new growth. LOL, glad you found a positive ID! I don’t have a photo of an Easter cactus, sorry. This explains why my “Christmas Cactus” is getting ready to bloom right now… I purchased them after Christmas, but they have always bloomed around Thanksgiving, since that time. My cactus is 90 Years old! My dad ( who is passed) brought a slip home from school as a boy! The lobes do not match what you have shown in your pics, although it does bloom during the Christmas season! Today, (I managed to keep it going) it spans 4 ft across with branches bigger than your thumb! Any thoughts on the kind it is? WOW, that is incredible!! I love it when plants have a long history and a story behind them. Thanks for sharing!! You can’t upload photos here, but you can share them on my Facebook page, or by tagging me on Instagram or Twitter. I’d love to see it! Thank you so much for your tips. I too did not know there were different kinds. I thought mine were Christmas Cactus but I just learned that I have 2 Thanksgiving Cactus. I’m happy to report that I have been taking care of them exactly how you say to take care of them. LOL, it’s a common mistake! Glad to help make a positive ID for your Thanksgiving cacti. Sounds like you’re a natural at caring for them, and I bet your holiday cactus plants flower beautifully for you every year! I just bought what I thought was a Christmas Cactus as it was labeled as such. Now I can see that it is definitely a Thanksgiving Cactus. Thanks for the article! You’re welcome! I hate when plants are mislabeled. Hope your new Thanksgiving cactus thrives for you! I have a Christmas cactus about 20 years old… I mixed all 4 colors in the pot. and it was beautiful ,,, But last year it got very woody… I tried everything… This Christmas it really looks like it’s on it’s last year.. What can I do to save my plant that everyone loved to see. Humm, it sounds like your Christmas cactus may have been overwatered at some point. If the main stem has already died, then the only way to save it is to propagate it. 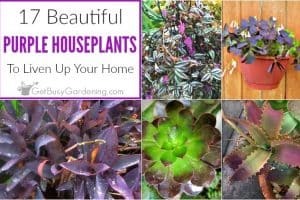 I would try propagating some of the healthy branches to see if you can grow new plants while still trying to nurse the mother plant back to health. That way, if the mother plant dies, you will still have new plants from it. I have a Christmas caucus. What window of light for the fall? I know it is the south window for summer but fall? Actually, you should put your Christmas cactus into the south facing window in the fall, and leave it there until spring. Then move it to a filtered sun location during the summer. Christmas cactus plants have opposite growing seasons as most other houseplants, and they like to rest during the summer months. I made a terrible mistake a year ago with a large Thanksgiving cactus. I didn’t know that a root bound Thanksgiving cacutus is a happy cactus. So I separated it into thirds and put the smaller plants into larger containers! UGH. All the plants are alive (and one even had a few blooms this winter) but I wonder if I should put all the plants back together into one pot. Yes, you’re right, holiday cactus plants do prefer to be pot-bound. I would either put them back into one pot, or repot each plant into a smaller pot. Good luck! I have a Christmas Cactus (I’ve had it for many years). Some years it doesn’t bloom at all, sometimes it blooms in August. It is starting to bloom right now. Should I put any fertilizer on it? I usually do once a month in spring & summer, but I’m not sure since it’s blooming! Thanks so much for your advice. I’ve never seen an Easter cactus, so I’m not sure. It looks exactly like the Christmas cactus pictured. As long as your Christmas cactus is healthy and blooming, then I wouldn’t worry that it’s not growing very fast. But you could try repotting it into fresh potting soil to see if that will help to trigger new growth. Yes, consistent lighting would be better for it in order to trigger blooming. They need bright light during the day… but, they also need darkness at night in order to bloom. So, if the lights never go off in the office, then this may be the problem. If you want your holiday cactus to bloom, I would bring it home so that you can control the environment better. Hello! I’m trying to save a co-worker’s Thanksgiving cactus that hasn’t been tended to, other than over-watering. I’m going to take it home, inspect the roots, and re-pot it. What type of pot is best? One that drains well? The container it’s in now is a ceramic square with zero drainage. Yes, put the Thanksgiving cactus into a pot that has drainage holes in the bottom for sure. My thanksgiving cactus has been flowering for years but this year the leaves are shriveling up and dying. What can I do yo save it? Shriveling leaves on your holiday cactus usually means the plant has been overwatered, but it can be caused by underwatering too. Check the soil to make sure it’s not wet. If it’s moist, then be sure to allow it to dry out completely before watering it again, and be sure the pot has plenty of drainage to prevent root rot. Also check the base of the stem to make sure it’s not rotting or mushy. Another thing that can cause holiday cactus plants to drop their leaves is when the air temperature is either too hot or too cold, or a if they experience a sudden change in temperature. 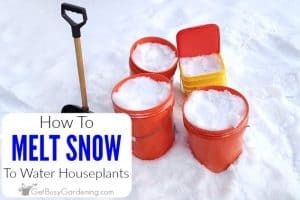 So make sure the plant isn’t being exposed to cold drafts from a door or window, or that it’s getting too hot sitting near a fireplace or heat vent.